The inconsistency between the online game guide and actual stats of items ingame have been fixed. So the Web Team recently made a few bug fixes to the Game Guide. These fixes should now allow the Game Guide to pull correct data from the game. Stormshield now displaying +1 Random Affix, as intended. Natalya's Embrace no longer displaying +170-200 as a DEX roll. This was never intended. I'll report back once I am 100% sure the Game Guide is without error. Thank you! Blizzard today announced that they will be reducing the bonus damage monsters deal in each Monster Power level. These effects are scheduled to go live after tomorrows maintenance. 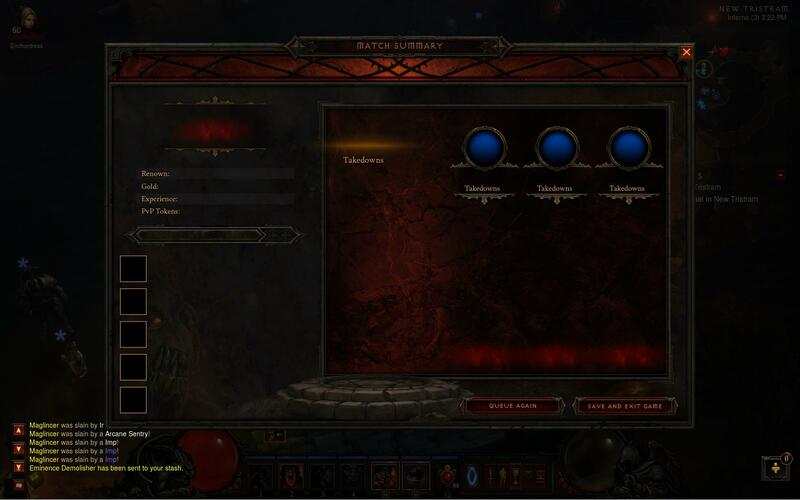 Maglincer a user from Reddit experienced a bug while he was playing a public game that sent him a PvP match summary menu. Unfortunately there isn't anymore information but it's still interesting to look at. Now if I had to guess I would say the top left recaps the experience, gold, PvP tokens and renown gained from a battle. I have no idea what the renown stat is but I assume it will be similar to arena points from World of Warcraft and used as your ranking points. PvP tokens is the one thing we actually know a little about as people have datamined information related to it. In particular this string exists in the client "TIP015 - Visit Gryffith the Warmaster at New Tristram’s Slaughtered Calf Inn to redeem PvP tokens for items." Which clearly means PvP tokens will be used as a currency for PvP items. The bottom left is perhaps where your team members portraits will be along with their stats from the battle. Lastly the right side with takedowns seems to be a place to recount all the kills and maybe even rank the top 3 players from the match. This week's community spotlight shines on Caleb Neal, a Blizzard game enthusiast who also happens to be one hell of a prop artist. 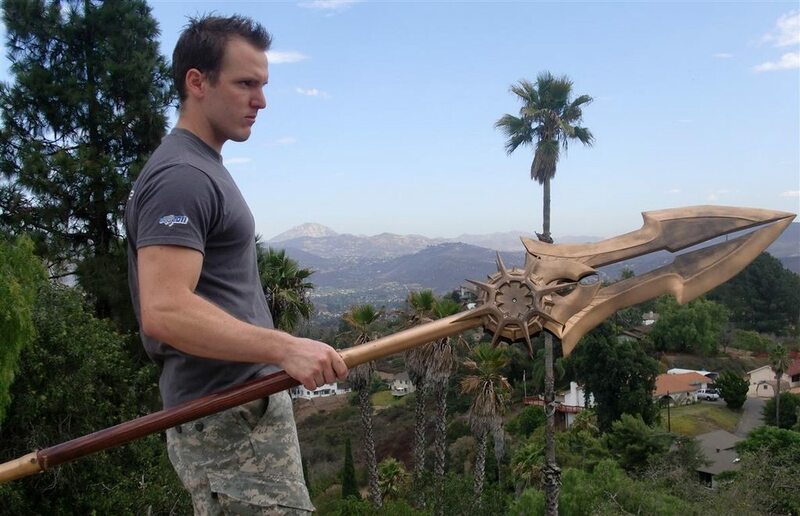 Whether you're on Team Angiris Council, a costumer yourself, or just want to see some great Diablo fan art, you won't want to miss his rendition of the archangel Imperius' weapon of choice. Check it out below. While it may not have been forged in the heart of a dying star or felled scores of demons alongside the Heavenly Host, this replica is certainly worthy of its namesake. To learn more about this piece and other works in progress by Caleb Neal, head on over to his website at http://fabricatordjinn.wordpress.com/. Xah'Rith the Keywarden - Too Hard? Players have been complaining that Xah'Rith is too difficult and makes normal progression through the act frustrating. Lylirra chimed in and noted that Blizzard agrees he is a bit too challenging and they may make changes in the future. It's not a bug, but we're definitely paying close attention to player feedback about Xah'rith's current difficulty -- not just in Inferno, but in all difficulty levels, and at all MP levels too. We agree that he may be a little bit too challenging at the moment, and are discussing the possibility of either reducing his outgoing damage, tweaking what affixes he spawns with, or moving his spawn location (right now, he's kind of hard to avoid if you're just questing normally). We'd like to hear more from the community on the topic first, though, before we make any decisions. In the end, we want the keywardens to provide a fun challenge for players, and be a little more difficult than the surrounding wildlife (i.e. a fight you have to put some thought into), but we don't want that to happen at the expense of being able to progress through an Act.